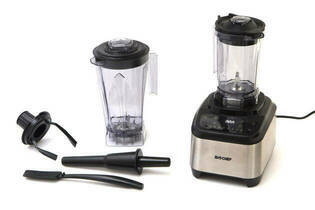 Snapshot: The Biochef Atlas Power Blender has 8 speeds and comes with a plastic (BPA-free) jug. How does it rate? Excellent at crushing ice, grating parmesan cheese, and making soup and nut butter. Very good at pureeing frozen fruit, milling almonds, and making a green smoothie and sorbet. Lightweight plastic graded jug (BPA-free). Jug can be placed on unit in any position. Spatula, tamper, and rotating dry jug with tamper. Count-down timer for pre-programmed functions. Jug is large (so can be awkward to wash in a sink). Need to hold lid while processing to avoid it flying off. Difficult to scrape out load as narrow base area can trap food. Jug sits loosely on unit and can be unstable. Liquid can be pushed up into the lid, so can drip when being removed. Pureeing, crushing, chopping, green smoothie, blending kale (60%) – regular blenders. Pureeing, crushing, chopping, green smoothie, blending kale, nut butter, sorbet (60%) – super blenders. For our tests we pureed soft frozen fruit (some older models pureed soup), crushed ice and chopped carrots. We made a green smoothie (a combination of English spinach, pear, kiwifruit, cucumber, mint, celery and water) and blended kale. For super blenders we also made nut butter, sorbet from frozen fruit, dough and almond meal, and grated parmesan. In the latest batch of super blenders we made hot soup from raw ingredients. The dough, parmesan, dry milling and soup scores don’t contribute to the overall score. We measured noise blending kale on the highest setting. Not suitable for making dough.